6061-T6 aluminum sheet has an ultimate tensile strength of at least 42,000 psi (300 MPa) and yield strength of at least 35,000 psi (241 MPa). More typical values are 45,000 psi (310 MPa) and 40,000 psi (275 MPa), respectively. In thicknesses of 0.250 inch (6.35 mm) or less, it has elongation of 8% or more; in thicker sections, it has elongation of 10%. T651 temper has similar mechanical properties. The typical value for thermal conductivity for 6061-T6 at 77°F is around 152 W/m K. A material data sheet defines the fatigue limit under cyclic load as 14,000 psi (100 MPa) for 500,000,000 completely reversed cycles using a standard RR Moore test machine and specimen. Note that aluminum does not exhibit a well defined “knee” on its S-n graph, so there is some debate as to how many cycles equates to “infinite life”. Also note the actual value of fatigue limit for an application can be dramatically affected by the conventional de-rating factors of loading, gradient, and surface finish. · bicycle frames and components. · many fly fishing reels. · The famous Pioneer plaque was made of this particular alloy. · the secondary chambers and baffle systems in firearm sound suppressors (primarily pistol suppressors for reduced weight and improved mechanical functionality), while the primary expansion chambers usually require 17-4PH or 303 stainless steel or titanium. · The upper and lower receivers of many AR-15 rifle variants. · Many aluminum docks and gangways are constructed with 6061-T6 extrusions, and welded into place. · Many parts for remote controlled model aircraft, notably helicopter rotor components. 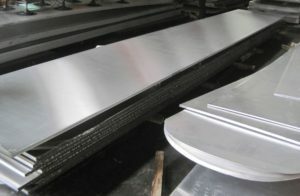 haomei Aluminum is one of the largest 6061-T6 aluminum sheet materials manufacturer in China, and China’s leading 6061-T6 materials supplier and export. This entry was posted in Aluminum Sheet and tagged 6061 t6 Aluminum sheet, Aluminum Sheet, What`s 6061-T6 aluminum sheet. Bookmark the permalink.